Starting a fire was never easier, safer and eco-cleaner! Eco Fire Nuggets is the perfect solution for quick and effective lightning of coal, fireplaces, wooden stoves, camping, firepits and more. The result: strong fire and perfect flame for 10 minutes, achieved quickly, efficiently and safely. Eco Fire Nuggets are manufactured from sustainable wood sources (pine tree) and food grade paraffin wax to ensure powerful combustion and safety at all times. Eco Fire Nuggets are small and user-friendly, they offer simplicity, safety and improved experience for making fire under various circumstances. They are composed of ecologically clean and safe materials. 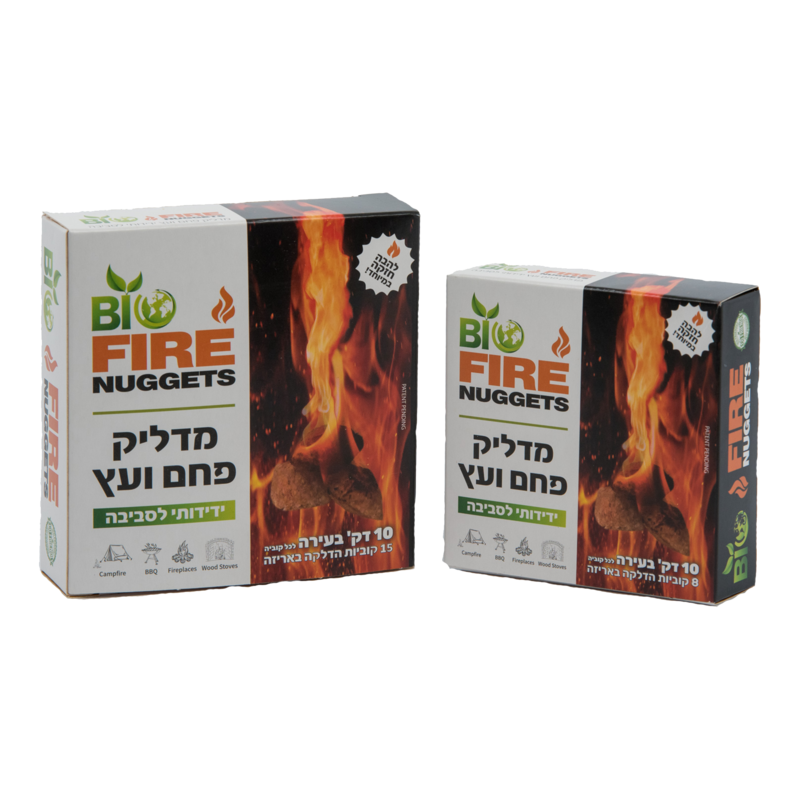 The Eco Fire Nuggets won’t leave unpleasant scents after helping you to start your fire, they do not contain Formaldehyde and other dangerous toxins. Each package was crafted with care, bearing your comfort in mind. Our product was created using the most progressive technologies, taking on ecologically clean raw materials, ensuring safety, excluding all kinds of toxins and working in an ethical manner. Eco Fire Nuggets is a must product for each and every camping enthusiast, responsible adults who wish to light a fire for their family in a quick and safe way. The nuggets will help you create a warm and cozy environment with no unpleasant odors or excessive waste. Put a package of 50 Eco Fire Nuggets in your car along with your grill and you can BBQ whenever and wherever you like. Indoors, you can light your fireplace or wood stove in a fast and easy way, creating a warm and cozy atmosphere. Always leave Eco Fire Nuggets at safe distance from your fire source. We believe in our responsibility & duty to support & provide equal opportunities to people with disabilities. Every human being has the right to be supported in achieving their independence, success and the sense of being part of the community.”Eco Fire Nuggets” supports these rights by providing work to disabled people through “Elwyn” organization. We believe in our responsibility & duty to sustain & protect our global environment. Our product is made of recycled sustainable wood source and recycled food grade paraffin. We donate 10% of the product in your box (5 free nuggets) for replanting our planet. By purchasing & using our excellent ‘Eco Fire Nuggets’ you are active contributors to this vision. Our company makes sure to deliver the best experience in every nugget, packaging them by hand and under close supervision. Available in packages: 8, 15 and 50 pcs.